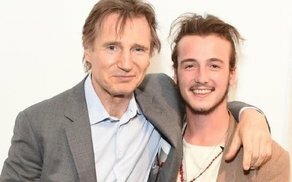 Liam Neeson and his son Michael Richardson have been revealed as the leading characters in James D’Arcy’s feature film debut as director, ‘Made in Italy’. Due to commence production on location in Italy next April, the comedy will follow Robert (Neeson), a bohemian London artist who returns to Italy with his estranged son (Richardson), to make a quick sale of the house they inherited from his late wife. Written & directed by D’Arcy (‘Dunkirk’, ‘Cload Atlas’), the film is being handled by HanWay Films, which begins selling at the American Film Market in Santa Monica this Wednesday, October 31st. ‘Made in Italy’ was developed by CrossDay Productions, with Pippa Cross & Sam Tipper producing the feature. Nicola Serra of Italian production company, Palomar (‘The Happy Prince’) will co-produce, with HanWay MD Gabrielle Stewart and CrossDay’s Janette Day executive producers. Mike Eley has been confirmed as DoP, while Chris Dickens has been named as editor for the project. Neeson can next be seen in Oscar winning director, Steve McQueen’s latest film ‘Widows’ which premiered at Toronto International Film Festival in September. The Ballymena native is also in the Coen Brothers’ western ‘The Ballad of Buster Scruggs’ and Irish feature film ‘Normal People’ directed by Lisa Barros D’Sa. Richardson has recently broke into the film industry, featuring as Renny in American TV series ‘Big Dogs’ and the Golden Lion nominated ‘Vox Lux’ starring Natalie Portman & Jude Law. The rising star can next be seen in action-thriller ‘Cold Pursuit’ due out in 2019. ‘Made in Italy’ is scheduled to begin production in April 2019.